Lots of Cosmo Cricket goodies! How fun is that? The next challenge is a wedding card and I believe the public will vote once the cards go up on Monday. I'll post more once I know more. So excited! The ladies at Right at Home Scrapbooking sent me papers and embellishments from Making Memories Wedding Line this month. I had a ball pulling the pieces apart and making a lot of non-wedding layouts with the line! However, before we get to that, I've got a super fun project for the summer! This is the front and back of a 7gypsies spinner card. The paper I used for the background on both sides, and for the banner on the front, was made by stamping with celery. ...to create the circles on the layout. This next layout has been the bane of my existence for the last forty-eight hours. I am not one of those quick scrappers who just puts stuff down and says "done!" And I have agonized over this one for a while. And (shhhhh, don't tell anyone) I actually re-did the layout. It just never settled into feeling really right and I kept staring at it and staring at it until it bugged me too much to leave it alone! I used a mixture of dye inks and Adirondack Color Wash to color it. ...blue, because the stark black and white was fighting with the photos a bit too much. This layout was a last minute addition. It was kind of a series of good mistakes. Behind the lace paper (Creative Imaginations), is a piece of cardstock that I had painted and sprayed for another project and then decided not to use. But, the color was just so vibrant, I had to use it for something! You can also see it in its "raw" state under the "J" in the detail photo below. I start most layouts with a story I want to tell. This one sort of just came together and then the fact that I could only fit one letter in the frame, gave me an idea for the journaling: "J" words that describe me! You could use the dress element on a card, as a package topper, on a page. Whatever your pleasure! 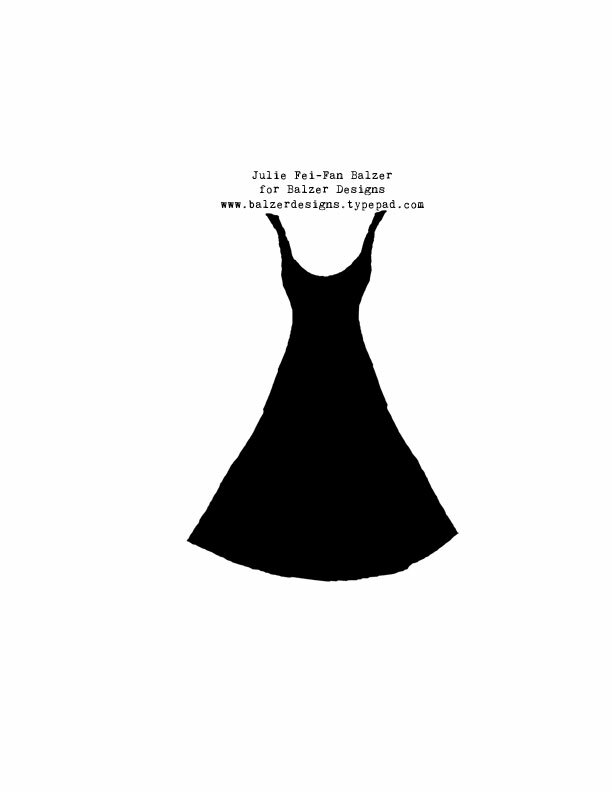 If you'd like the template I used to make my wedding dress, you can download it here. Whew. Monster post. Thanks for stopping by! This is a post that I wrote for the Right at Home Scrapbooking Blog. It appeared on that blog a few days ago. Today, I want to share an easy way to be inspired by modern art: use it to create your background! Now, given how much I paint on my pages, it would be easy to look at these paintings and find inspiration by copying those blocks of color directly. What a cool background for a page or a tag, right? You can see that I turned the background sideways. I added my photo, some flowers, a title, some journaling, and a few doodle dots! Super simple! Now it's your turn to be inspired by art! Pick an artist you like or just head to your local museum or art gallery for some easy inspiration! 8.5x11 isn't really a scrapbook page size that I ever work with. Occasionally, I'll do 11x8.5 (i.e. landscape), but I've just never been an 8.5x11 girl. Another thing I stink at is two-page layouts. I really have a lot of trouble working with the 12x24 canvas. I just don't "get" it. So, I decided to do some experimenting. And lo and behold, I'm loving the 8.5x11 two-page spread. Pretty cool! If you're not familiar with Two Peas, it's the biggest scrapbooking site around. The gallery has hundreds of layouts in it, so I'm tickled pink! Just proof that experimenting is always a good choice! LOL! Send me your address Sue and I'll send you your box of stuff! Nothing like some shopping to brighten a girl's day! Totally thrilled to start making some art with this! I've been wanting a typewriter FOREVER and I'm delighted to have one that works well and looks absolutely adorable! It's a vintage typewriter from 1935 and it has been cleaned and refurbished. Because the decals are faded, I got it for a great price. Plus, it's a portable typewriter, so it's lightweight (relatively) and that makes me happy! Finally, it's a very mainstream model, so the ribbons are supposed to be easy to replace. Yay! Old school circle punches. I find there are some sizes of circles that are too small for my current circle cutter (the fantastic and highly recommended curvy cutter). And so I decided to bite the bullet and buy some circle punches in a variety of the smaller sizes. Watch for my circle obsession to continue! I have been playing with my new Caran D'Arche watersoluble crayons. These things are so deeply pigmented and lovely to work with! My favorite way to use them is to outline something (a circle or an object) and then scrub a wet paintbrush over the top. The colors blend seamlessly. It's awesome. They're kind of pricey, but a really good addition to anybody's art box! I bought the little box (pictured here) and someday, I'll go for the really big box! I bought this book a while ago, but I just started reading it last night. It's soooo good! Plus, inside it's spiral bound! That's going to make it so easy when I actually start experimenting with some of these techniques! It'll lay perfectly flat on my desk. No weighting down of pages required! I just ordered like twelve of these American Crafts D-Ring albums. Okay, not twelve. But, at least six. My poor layouts are sitting in sad little piles. I finally got disgusted with myself when I realized that every album in my house is bursting at the seams and I have a huge shipping box FULL of layouts PLUS a pile that is beginning to grow to knee height sitting on the floor. Too prolific for my own good. Sigh. I can't wait to bring some order to the chaos. If you've seen the pics of my crafty room, you know what I'm talking about! It's a Flip Ultra HD Camcorder. And it is a thing of genius! When I do the videos for my blog, I use the camera built into my computer. And it does the job. But, it's certainly not particularly clear or beautiful and doesn't really do well with the lighting in my apartment. Plus, I have to be able to put the computer wherever I want the video to be coming from and I've got a big laptop. This little camera fits on any standard tripod, takes HD video and goes anywhere! I love it! Okay, I know that this ICE Resin doesn't look like anything at all. But, I took a resin class from Susan Lenart Kazmer at the Bead&Button Show and it blew my mind! Basically, you mix the two parts to create a viscous liquid. Then, you pour the resin into a mold or bezel and it domes as it dries. You can also paint paper and ephemera with it (or even Christmas lights) to preserve them. Way cool! This is my all time favorite color of acrylic paint. School Bus from Making Memories. It's harder and harder to find. I'm hoping to stumble across some this summer. Otherwise, I'll have to hunt it down online. Oh my God! Oh My God! Oh My God! The misting mats from Tattered Angels are finally here! Eeeeek! It's a 24x36" teflon sheet! I currently work on much smaller mat and I am dying to get my hands on this one! Though, I'm not much of a pink girl, truth be told, and I'm kind of sad that it's pink. I wish it were more neutral, but beggars can't be choosers. It's definitely in my mental shopping cart! I've been reading about these mini photo studios. They're collapsible boxes that come with reflectors and little lights so that you can take really excellent photos in your apartment. I'd love to be able to take better photographs of some of my jewelry and other artwork. But, it does seem a little extravagant, doesn't it? Well, a girl can dream, right?! So, what have you been shopping for recently? Do tell! I am becoming a seriously prolific blogger these days. It's kind of scary. Hope you're enjoying reading as much as I'm enjoying sharing! Thank you for taking the time to stop by. I appreciate it. I'm teaching my "Journal Quilt" class tomorrow (Friday) at The City Quilter and we're focusing on embroidery techniques. I'm really looking forward to it - both because I loooove the class, and because embroidery is such a nice diversion sometimes (although my fingers are pretty sore). Plus, I'm teaching my "redneck embroidery," which is always fun because it breaks all the rules! This piece is a little larger than 8.5x11, just to give you a sense of scale. The background is an old rag I used to clean up my painty messes for many months. It's still a little bit in progress. I'm thinking of adding some text. But, I'm going to let it marinate for a week or so before I decide. Love to know what you think! And I will have to do a bit of quilting and finish off the edges, but in the meantime, it's my Project Fifty-Two contribution this week. Can you believe that this is already week 25? The year is just flying by!